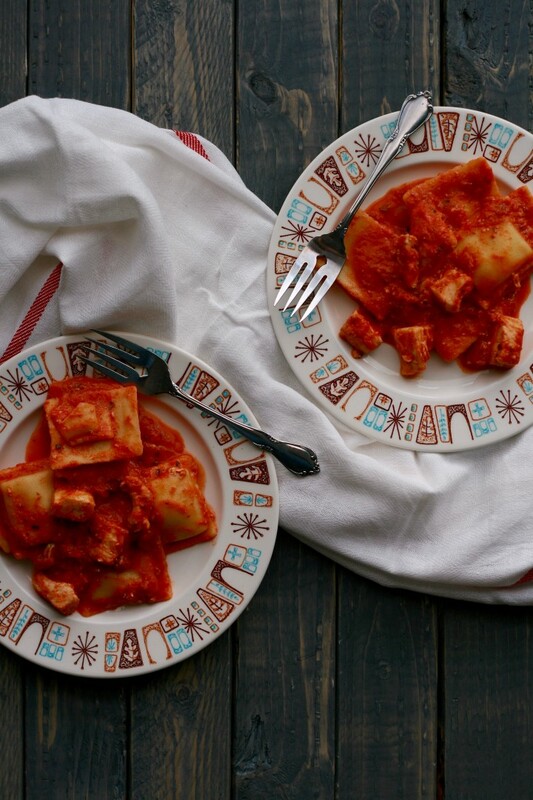 Chicken ravioli is about as easy as it gets. Need to get dinner on the table in a hurry? This dish will become your new BFF. Lucky for me my family loves buttered macaroni. Add a little….okay a lot of butter and a couple cracks of freshly ground pepper and you have yourself a tasty dinner. Buttered macaroni is something my mom would make on a Saturday when my dad was out fishing. Easy, cheap, and filling. I could serve my family buttered macaroni once a week and I wouldn’t hear any complaints. While buttered mac is delicious I wanted to have something with a few more vitamins and nutrients than buttered mac but that I could get on the table in roughly the same amount of time. 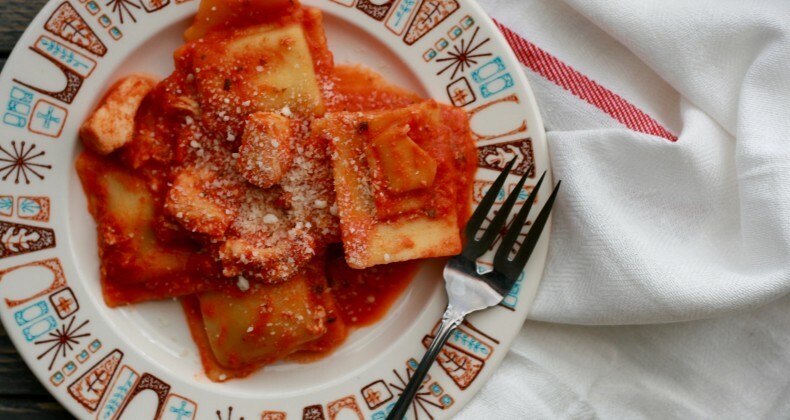 You can use fresh or frozen ravioli depending on what you pick up at the store that week. I’m not picky here. ¯\_(ツ)_/¯ In order to cook the chicken quickly I cut up the breasts in to bite size pieces. The chicken cooks while the water and ravioli boil. Sort of a two birds one stone thing. Once the chicken and ravioli are done they get tossed together with a little marinara sauce and a splash of cream. Bingo dinner is ready! Did you see my post last week about 15 dinners ready in 30 minutes or less? I have pledged to skip the easy way out and stay out of the drive thru lane this month. Quick dinners like this help me keep my pledge. Join me in skipping the fast food. Buttered macaroni-YUM!!!!!!!! One of my favorites too, but PAPA Tom would not even taste it. This looks really good. Pasta of any kind–YUM. That looks so easy and delicious! I hope you enjoy Shaylee! This ravioli looks delicious! I love how quick and easy it is to prepare! Definitely the perfect dinner any night of the week.